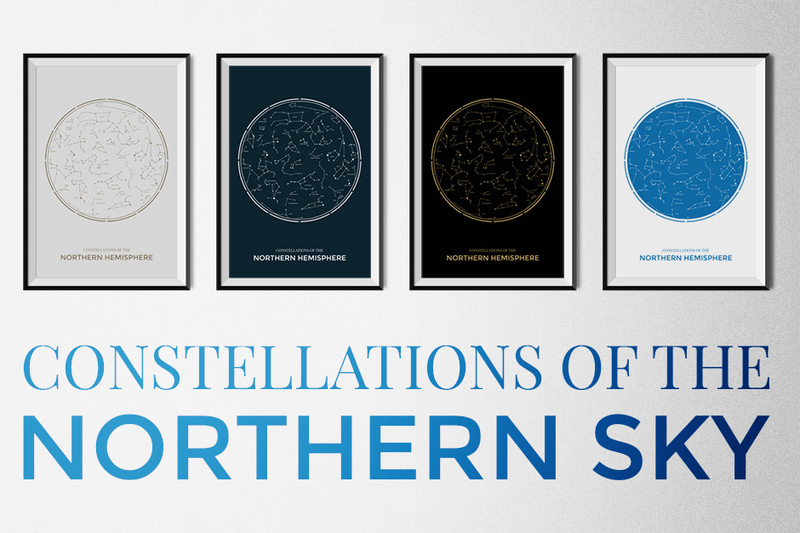 Constellations of the Northern Sky includes 4 unique, hand-drawn poster designs showing the stars and constellations in the northern hemisphere. Each design measures 24×36 inches and is fully editable to allow for easy resizing and color changes. They are also print-ready at 300 ppi. These would be fantastic prints for office art, posters for a kid’s room, and many other uses. • Illustrator .AI (CC and CS3) and .EPS files with editable vector objects. • High-resolution .PDF and .PNG formats. • Text file that explains where to download the free fonts used. • Please note that the frame mockups are not included but can be downloaded for free (links in text file). Software compatibility: Adobe Photoshop and Illustator CS3 and newer. .EPS files will work with a variety of programs such as Adobe Photoshop or Illustrator, Sketch, InkScape, Affinity, Corel Draw, etc. .PNG files will work with most graphic software. Illustrator .AI (CC and CS3) and .EPS files with editable vector objects. Photoshop .PSD file containing all elements as scalable smart objects. High-resolution .PDF and .PNG formats. Free Fonts and Mockups text file with links. File size is approx 39.7MB (185MB unzipped), offered as a single download. Do the constellations come as separate files, or just the one shot? For example, during the summer Ophiucus and Serpens can be seen its entirety but you have it shown cut off along the edge. Are the whole constellations included separately so we can create a map of the constellations as they would be seen during different times of the year? These files are provided as pictured in the previews I am afraid as they are poster designs and not the full constellations as separate files. My sincerest apologies for any disappointment caused! That’s okay, I just wanted clarification! Would love to see a corresponding Southern Skies package in the future.